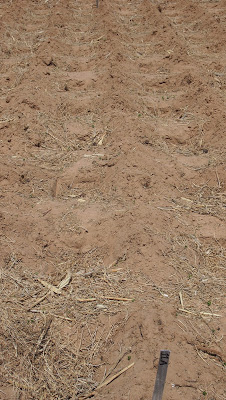 Our Zai field has 5,760 holes and mounds, all hand dug, manured, planted, and when we can help it, hand weeded. It takes about a week to have 8 day laborers casually weed it. 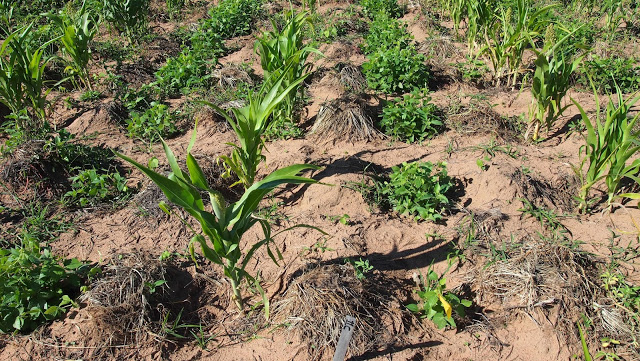 Glyphosate use may be in our future, but thus far none of our experiments here have used generic Roundup due to the fact that we are mostly interested in two things: looking at the changes in soil fertility and soil biology. Since labor is abundant and inexpensive here, we have the luxury to side with the research that suggests glyphosate negatively affects soil biology and thus we weed all our plots with hoes and scuffle boards. This is the third and possibly last season for this experiment. In it we have examined changes in soil fertility and biology, and also soil moisture, yield (grain and pulse), biomass amount and nutrient contents, all through 15 treatments over time. We look at the effect of manure that is concentrated vs. broadcast; the effect of preplant vs. split manure application; the effect of flat ground vs. Zai; the effect of a solid grain plot vs. a legume-intercropped plot; the effects of 4 different legume intercrops. In all the Zai plots we planted Sorghum bicolor ‘Macia’. Sorghum is a grain that looks much like maize until it flowers. Its grain is all in a head on the top of the plant and is known for being drought tolerant, an important trait in places with low or erratic rain. 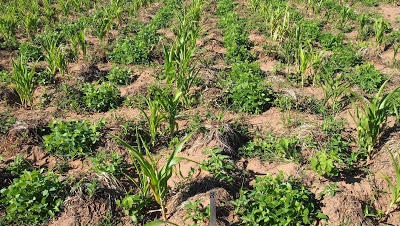 Sorghum is intercropped in legume treatments with 1.) Lablab purpureus ‘Highworth’, 2.) Vigna ungiculata ‘IT98D-1399’ [Black-eyed pea/cowpea], 3.) Macrotyloma uniflorum [Horsegram], and 4.) Cajanus cajans ‘Caqui’ [Pigeon pea] with cowpea. —Higher microbial amounts in the soil promote overall health of the soil by building structure (microaggregates). 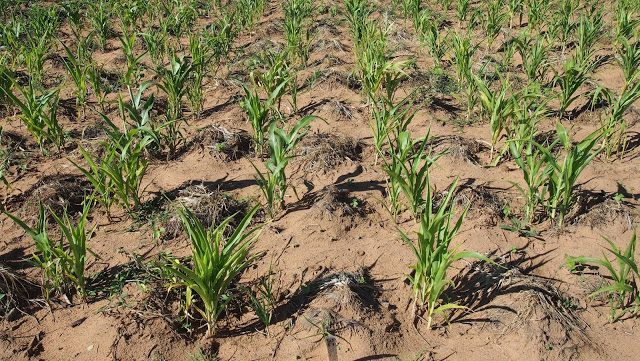 Especially, microbes cycle nutrients from decaying matter and mineral surfaces that can then become available to crops. Sometimes these microbes even live on and in plant roots, bringing or generating nutrients right where the plant needs it. 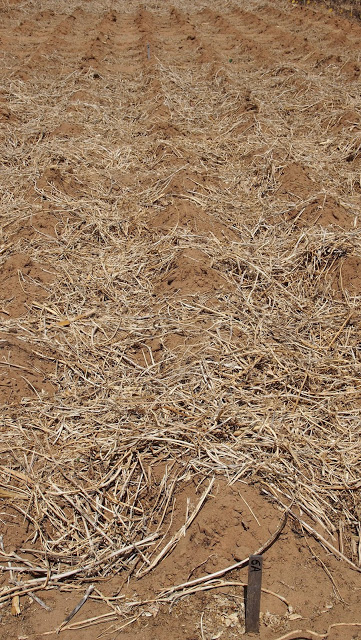 —Nitrate is the most commonly limiting nutrient in soils. 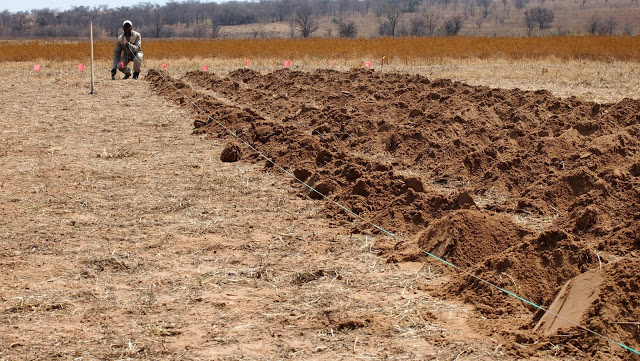 In poor soils, farmers need to use any way possible to increase their organic matter, like by intercropping with Lablab. More organic matter (like from the residue shown above) means the soil can hold onto more nutrients like nitrate. —Increasing carbon is important to feed and build populations of microbes in the soil; it is the building block for soil health and a precursor of organic matter. Organic matter strengthens drought resistance by increasing infiltration of water and holding onto it. The average for most soils might be 5% for optimum benefits. Our plots have less than 1%. Not quantified in research is the value of mulch beyond its contribution to soil nutrients. 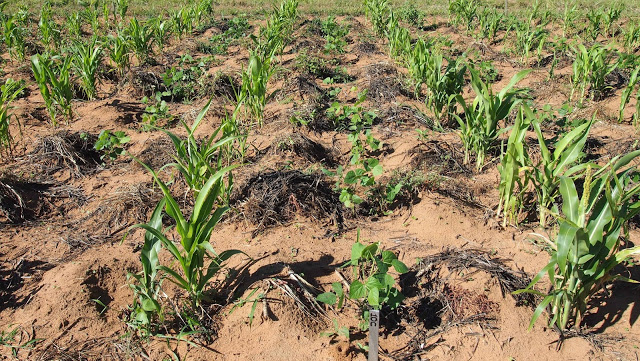 The sorghum plots that were intercropped with legumes had the added benefit of having residue that protected the soil from harsh winds for about 5 months during the dry season. When building soil in semi-arid regions, every bit of organic matter counts. In days the small fraction of carbon that is being stored long-term in the soil could be blown away. 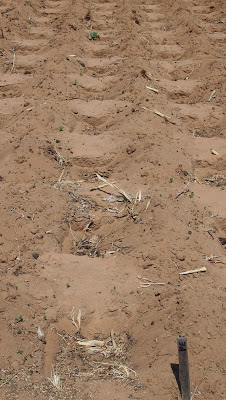 If the residue is thick enough, it will also suppress weed growth when the rains come. Zai might not be very stable here without soil crusting, but the results suggest some of its principles are working anyway in improving the soil. It will be exciting to see what some of these values become after a third season, and the possibility for small famers to find a season of plenty, slowly increasing over time.